Hugh J. Campbell Son of a steelworker, Philadelphia, Pa.
Pope Francis and Bernie Sanders have been speaking the language of the people -- expressing concerns about the environment and the economy and calling for solutions -- and their approval ratings are soaring.... while the US Congress has been ignoring these concerns and they are lucky if they can raise their collective approval rating above single digits. Pope Francis is standing up against the Jesus-with-a-gun "Patriot" soldier Christian image that was branded by George W. Bush in his run to become the 43rd president of the United States -- an election he won with overwhelming support from "Evangelical Christians." There is no doubt that the #GOP - Republican Party a.k.a. "Greed Over People" is fully bought-and-paid for by the #Billionaires and their multinational corporations... then here's a Pope in their face in 2013 --- Taking back Jesus! 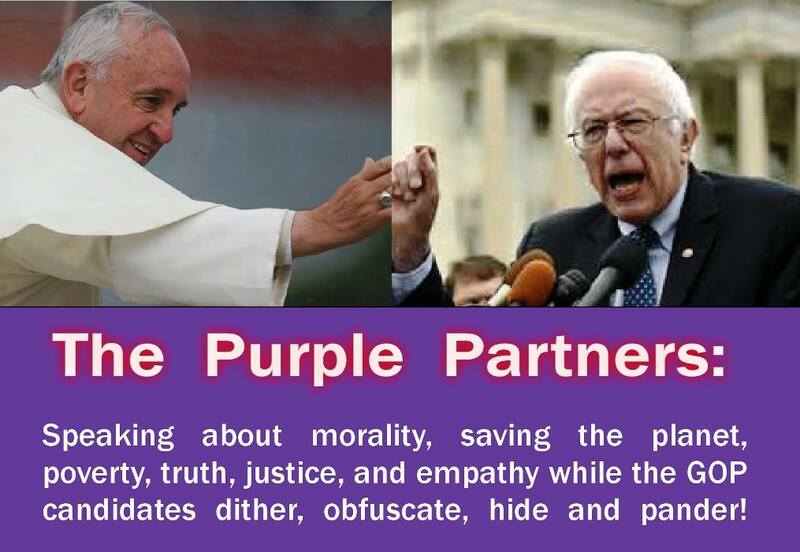 The article, The Pope is Taking Back Jesus - In America states that the top challenger for the Democratic nomination could not be more different. Sanders is against the Trans-Pacific Partnership trade agreement and against the Keystone XL pipeline, reasons that the largest nurses' union decided to endorse him. On the other hand, Hillary gets a huge chunk of money from the Wall Street bankers that Bernie Sanders intends to tax in order to pay for tuition-free college. He also intends to let students refinance high-interest US Government student loans. These are some of the differences that will be discussed at the Democratic Presidential Debates that begin the evening of Oct. 13, 2015 on CNN. To submit a blog to Union Matters, e-mail it to bstack@usw.org. Keep it to 250 words or fewer. You MUST include your full name, hometown, and state. You may attach a photograph of yourself. Please include a phone number. This WILL NOT be published. Posting any given blog is within the discretion of the USW. No blog using foul language (this is a family site), false information (we don’t want to get sued), or unnecessary personal attacks (again, we don’t want to get sued) will be used. Wait a reasonable period of time, then blog again! Hugh Campbell is a seasoned financial professional, currently providing subject matter expertise on a variety of regulatory topics, including the Dodd-Frank Act, the Foreign Account Tax Compliance Act (FATCA) and overall compliance monitoring. Hugh has previously held positions as Chief Risk Officer (CRO), Chief Audit Executive (CAE) and Director of Sarbanes-Oxley (SOX) Compliance.